I have never raced on my birthday so this year I was determined too and my birthday falling on a Sunday meant that I had quite a few races to choose from. There was the marathon weekend in the New Forest, the Chard Chaser, Ash excellent 8 in Martock and the Shepton Beauchamp 10km, but I chose the Bude Pirate Run. I decided on Bude Pirate Run organised by Bude Rats running club as I haven’t been to Bude, plus Michael could surf whilst I was running and then we could chill on the beach for the rest of the day. The race wasn’t starting until 1030 so this meant that we didn’t have a too early start, we left home around 0730 and had a beautiful drive up to Bude on the North coast and arrived after 0900. Even at this time people were milling around, I collected my number and the lady said ‘you have come a long way’ I replied yes but my fiancée can surf, and I wanted to race on my birthday. Michael and I chilled out at the café and I tried not to get too nervous, we were sat near the route map, so I heard the man explaining the route in detail to people. This was really interesting and later when I was running I knew what was coming up ahead. As it was my birthday I just wasn’t to relax on this run, enjoy it and look at the views, I was nervous as I had seen the elevation and I was not looking forward to the two-mile hill in the first half of the race. 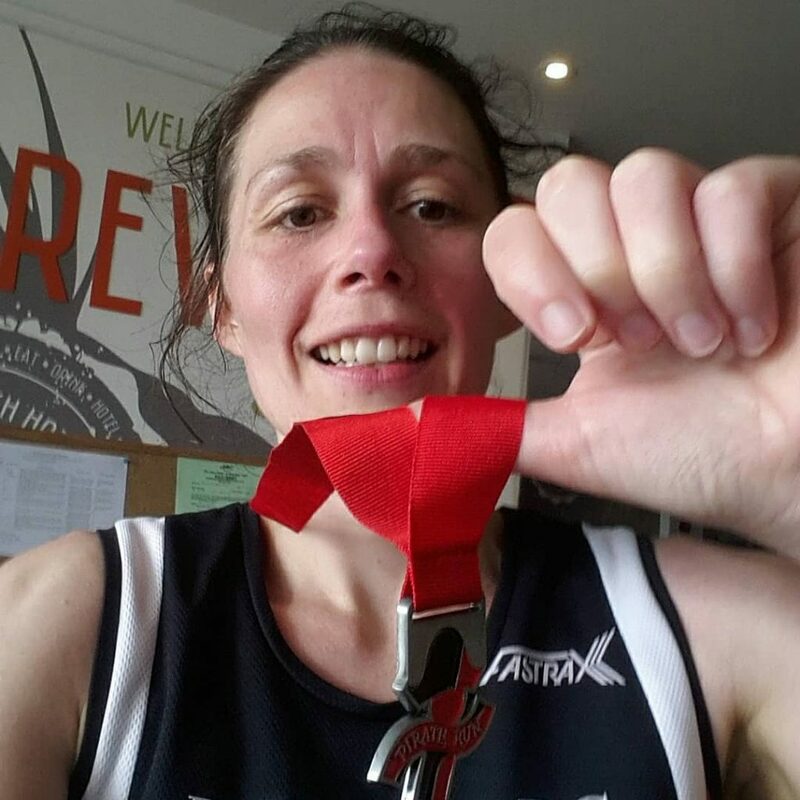 There were a lot of serious looking runners, so I positioned myself near the back, which came to be a mistake as within 1 minute we were climbing a short hill and I was stuck and couldn’t overtake people as the road was narrow. I over took when I could, and I settled in to a pace and soon we were running down the hill towards the bungalow that does the best cream tea in Bude, as told by the man explaining the route to runners. We climbed the steps up the cliff opposite and at the top the views of the countryside ahead were bathed in sunshine and on my left you could see the rugged coastline with the waves crashing. The two-mile hill was just a long steady climb with the odd very short steep parts dotted along, it was manageable if you settled in to a nice easy pace although you could see far in to the distance and the path seemed to go on for 5 miles. Eventually we entered the wood, which was cooling, and we could enjoy a nice downhill section on soft ground and it was so peaceful in the wood. When you emerge from the wood you are in a deep valley with a steep cliff either side of you and a beach in front and you could just see the foam of the waves as they crashed. There were a large number of the public here visiting the beach but giving you support too. There wasn’t much time to look ahead to the waves as we turned the bed and it was time to power up the first of two cliffs to climb out of the valley we were in and start the return journey back to Bude. The path up the cliffs were not too steep with one man in front of me running up them, but I at this point was taking this race relatively easily and I did not want to irritate my calf. I did try to take in the views whilst I was power walking up these cliffs as the sun was shining and it was reflecting off the water. At the top of the second cliff my watch just froze, and stayed like this for, I’m guessing a mile and a half, I was worried that it would stay frozen and I would cross the finish line and my birthday race would not be recorded. I caught up with a runner in front of me and I asked him what distance we were at, we were at six miles, so I decided to pick up the pace, I thanked him and over took him. The last 2.5 miles back to the finish were very undulating but there were long sections of relatively flat paths which you could pick up your legs to make up time for the steeper segments. Running down one of the hills I started to recognise the area and we were back at the ‘cream tea’ bungalow, and here now where some patrons of the bungalow to cheer us on and up the final hill. This hill seemed much steeper when we ran down it at the start but going up was fine as it was only short, and I had the power to run up it. The end was in sight, so I had to just keep the legs going which was a mental battle as they were tired and each teeny tiny change in gradient was a killer. I over took a few runners and at the top of the last little hill there was a very friendly marshal to let us know that it was downhill all the way to the finish. I was overtaken at this point by a runner who I didn’t realise was so close behind me, I tried to sprint after him, but he was just too fast. I kept the sprint going down the hill and it was in to the finishing straight and no one else over took me, as I crossed the line the announcer said happy birthday to me which was a lovely touch. I was given my medal and then I collected my beer and pasty and waited for my best mate and boyfriend and Michael to appear. I finished the race in 95th place out of 227 runners in a time of 81 minutes and 10 seconds, I was slightly annoyed that I wasn’t under the 81-minute mark. After meeting up with my friends and Michael we went in the sea, they body boarded and surfed and I just had a dip, think this froze my slightly aching calf. We then had lunch in one of the cafes and spent the rest of the afternoon on the beach with a bottle prosecco, cake and a cup of tea. The 8.5 mile off road route is a circular shape with the first and last 2 miles being along the same undulating path. From the start you run up the road and take a left-hand bend and hill a short hill, this was quite congested as there was on street parking, so it was hard to overtake runners, so I would suggest starting higher up in the field of runners. After this short road hill, the route is undulating before a steep downhill which brings you to a bungalow and little cove and you are faced with steps up the cliff in front of you. The next segment to the race is a steady 2-mile climb across fields and through farms, this looked much worse on the elevation profile then it was running it. This climb was on gravel paths and dirt tracks, so this hard footing made the climb easier, although it might be different if it was wet underfoot. At points along this climb there are beautiful views to the sea and then have sweeping vistas over the countryside, of course this is weather dependant! At the end of the climb brings you to the edge of a wood and the start of a nice downhill section through the coolness of the trees which brings you out at a beach and the halfway-ish mark. Being down in the valley you know that you need to climb upwards in order to get back to the finish line and having looked at the elevation profile I knew that there were two cliffs to climb. Walking up these were fine except right near the top when they got steep, however luckily the descants down the other side were manageable and you just had to keep your eyes peeled. The last 3 miles were undulating with the odd steep climb which were all runnable, there were a few more marshals around which was a nice sight to see. Eventually you run down a hill and you reached the bungalow and the cove that you passed on the way out and you know you are at the finish. Up a steep hill (opposite the steps), the next section is still undulating but at this point you are so close to the finish that you try and keep the legs going. On the brow of the hill a friendly marshal is there to tell you that its less than a quarter of a mile to the finish and that it is downhill. You pick up the speed and use the last bit of energy to gain a few seconds on the downhill, turn the corner and the finish is at the end of a very short, flat road. 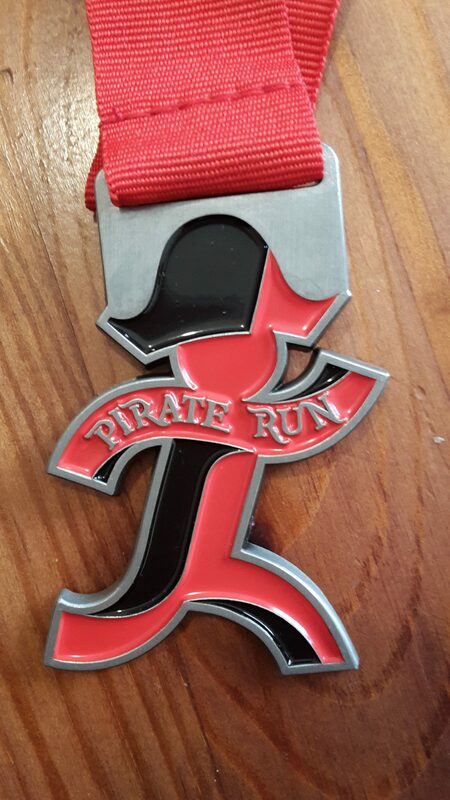 A pirate shaped medal plus a can of beer and a hot pasty. Great organisation on the day, there was no Que to pick up race numbers and there was a really friendly man from Bude Rats stood by the route map telling people everything they needed to know about the route including important tips like these rocks here could be slippery. There were marshals at important parts, but I felt there could have been a few more, however you would have to somehow get marshals to these points and the route was clearly marked. As a warning the results showed that 3 runners were disqualified for wearing head phones. Social media was used to let you know that the race was filling up fast, in fact it was full in July and there were a few posts before the race and after with photos and results. Yes, I would as it is a tough but manageable run with 8.5 miles being an unusual distance to race plus you get beautiful views if the weather is good. A good proportion of the paths are either track or gravel, so it is good footing to climb those hills, the only points that could be really muddy is through the wood and the two-steep cliff climbs at the halfway mark. A big bonus is that you get a pasty at the end and the start is at Crooklets beach where there is a very large carpark plus a few cafes, so any supports can chill out whilst you run, or they can have fun on the beach and in the sea. Just as a warning the sea has a rip tide and the waves can be quite big, perfect for surfers but not for a gentle dip in the sea.